Air Stripper .177 .22 & 0.25 Calibre. Natural Aluminium. For all Barrels with 1/2" UNF Male Thread up 14mm long. Air Stripper .177 .22 & 0.25 Calibre. Black Anodised. Air Strippers for barrels with 1/2" UNF male screw thread. The air strippers come with the choice of a natural, black anodised or brass cone. The cone has 8mm forwarard / backwards adjustment. 1/2 UNF Stripper fitted to BSA Scorpion. Larger photo of air strippers with black body and brass cones . For Barrels with 1/2" UNF Male Thread up 20mm long. 1/2 UNF Stripper fitted to a HW100 rifle. Air Strippers for Daystate Tsar and Rifles with 1/2" barrel diameter. Air Stripper .177 & .22 Calibre. Natural Aluminium. 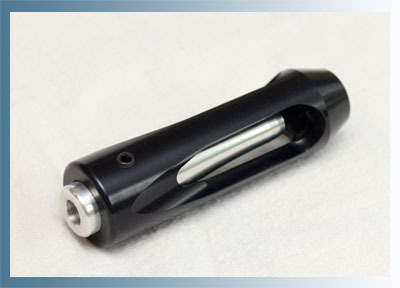 For Barrels with M10x1.0 Male Thread up 15mm long. Air Stripper .177 & .22 Calibre. Black Anodised. 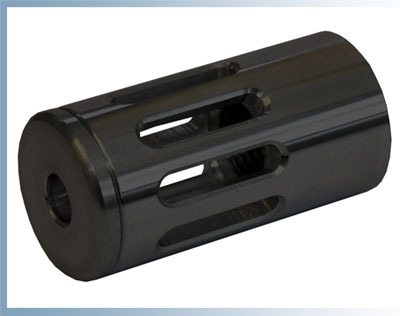 For Barrels with with M10x1.0 Male Thread up 15mm long. and any other rifles with M10x1.0 threaded barrels. LG110 Air Stripper 16.0mm & 16.1mm Barrels. Natural Aluminium Body and Cone..177 Calibre. 177 Calibre. Black Anodised Aluminium. Black Anodised Body and Cone. 177 Calibre. Suitable for 16mm plain barrels. LG110 Air Stripper. Natural Aluminium body and cone. Slides 45mm on to the barrel and fixes with 2 grub screws. flat on the underside to give clearance with the air cylinder. 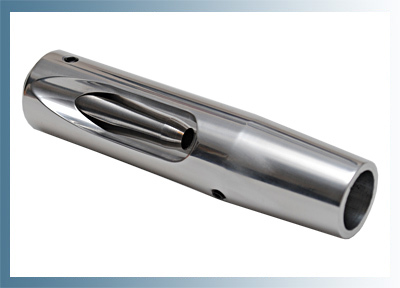 Choose 16.0mm diameter for non-coated silver barrels. 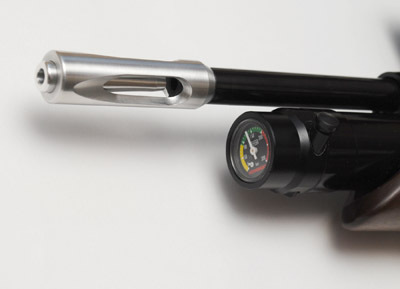 Choose 16.1mm diameter for black coated barrels. EV2 Air Stripper .177 Calibre. Natural Aluminium. Natural Aluminium Body and Cone. Note : Some EV2 rifles have 14.0mm barrels. 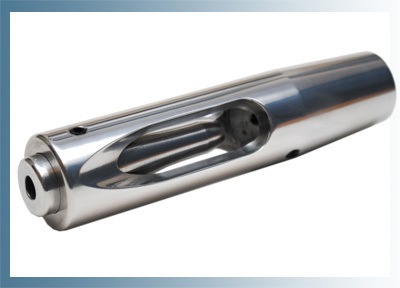 For 14.0mm barrels please see 14.0mm MPR Air Stripper . Suitable for 15mm plain barrels. EV2 Air Stripper. Natural Aluminium body and cone. Stripper body is 24.5mm outside dia. For pellets up to .22 cal. 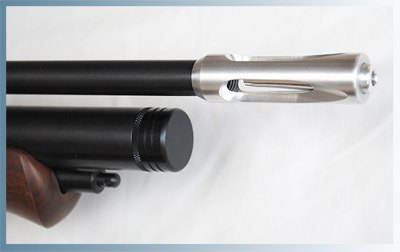 For pellets up to .22 cal..
Mini Muzzle Brake fitted to BSA Scorpion. Muzzle brake body is 18mm outside dia.x 50mm long. The 1/2" unf internal thread is 18mm long. There are 8 vent slots. Available in natural aluminium, black anodised or brass. 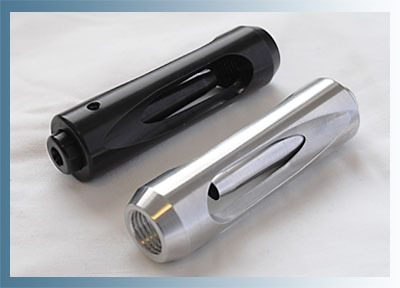 Muzzle brake body is 24.0mm outside dia.x 48mm long. The 1/2" unf internal thread is 20mm long. There are 9 vent slots. 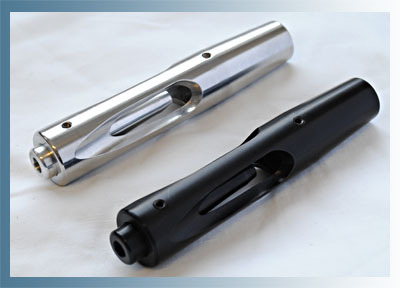 Available in natural aluminium or black anodised.